My wife Abby and I are big fans of the A&E television series, later turned Netflix Original Series, Longmire. The fact that this show is, like so many others, on Netflix is a double-edged sword: we can watch as many episodes at a time as we want, but upon watching them all in one weekend, we have to wait 363 days for the next season of episodes. There are several reasons we like Longmire so much. It is set in Wyoming but filmed in New Mexico, including Santa Fe, Red River, Eagle Nest, and Las Vegas, all high on our favorite places list. We like the actors, particularly Robert Taylor in the lead role, Cassidy Freeman as his daughter Cady, and Lou Diamond Phillips as Henry Standing Bear. We like the plots and the character development. But like any show, Longmire tends to feel obligated to bend reality to serve its marketing strategy, creating a world that is easier for the consumer to digest, and keeping things relatively simple for the viewer. Abby and I live in a small community whose police is primarily the sheriff’s office, and I have a lot of experience following law enforcement, so I have a certain level of expertise. 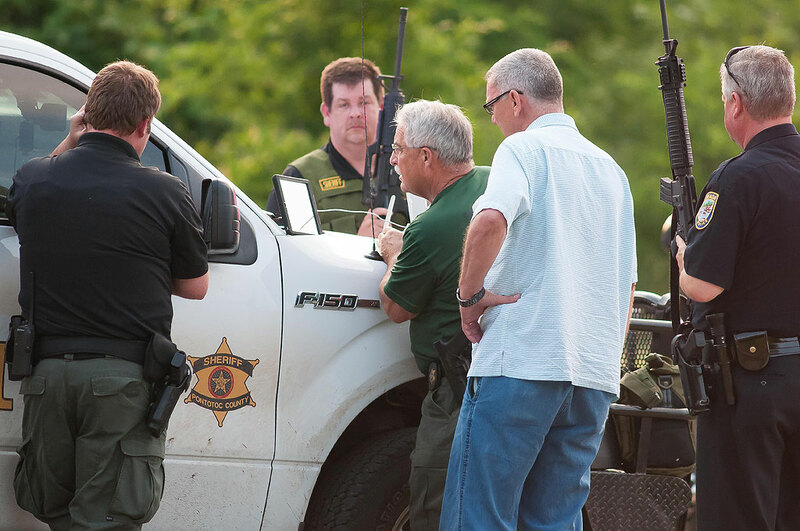 Pontotoc County Sheriff John Christian and Ada Police Chief Mike Miller, surrounded by officers and deputies from several agencies, work to find a fugitive during a May 2016 manhunt in Byng less than half a mile from our home. Absaroka County, Wyoming’s per capita homicide rates rivals south central Los Angeles. Deputies and tribal police are all equipped with handheld radios (Bailey Chase’s character Branch Connally and Zahn McClarnon’s character Mathias wear them on their belts), yet are never seen using them. The argument that cell phones are more reliable than radios is incorrect: cell phone service in large areas of varied terrain is inconsistent, but modern radio systems are developed to combat exactly that, with multiple high-elevation repeaters. Public safety agencies can’t afford to rely on commercial cell service. Radio étiquette is beyond casual. They call each other by name and talk about all sorts of confidential items like it’s a private line, which it is not. In our county, every unit (the smallest division of public safety, usually an officer, firefighter or medical technician) has a unique number like County 14, Med 4, Tanker 506, or Ladder 9. And private messages are usually sent via text message or to mobile data terminals. The Sheriff and Cheyenne tribal police (sometimes misidentified on their cars as “BIA Police,” which they are not) are set up in the plot to be at odds with each other, which is almost never the case. In our community, Pontotoc County Sheriff’s deputies, Chickasaw Lighthouse Police, Oklahoma Highway Patrol, and Ada Police officers are all cross-deputized, and work together all the time without animosity. Longmire tries to establish this as red man vs white man, but in law enforcement, all police are always blue first. The state police are practically nonexistent in the Longmire universe, which is absurd. State police are typically among the most elite law enforcement agents in any state, and often spearhead things like manhunts. Any town of any size has its own police department. Longmire is set in the fictional Durant, Wyoming, but there doesn’t seem to be any municipal police presence of any kind. Durant, Oklahoma’s Police Department has 41 sworn police officers. No city, county or state in the 21st century responds to vehicle accidents with a single deputy, as we have seen in Longmire, but with a phalanx of first responders, with city or volunteer fire departments in the lead. The severity of gunshot wounds in Longmire follows very closely with the necessity of the plot. The fact is that any gunshot wound into a human body, even a “through-and-through,” is a very serious injury. The instant a serious crime or a crime involving a member of law enforcement (such as we covered in May) occurs, the state investigative body is called in. Besides the necessity of propriety, smaller agencies don’t have the time or the resources to investigate things like police-involved shootings. That’s why states have investigative agencies. In Oklahoma, it’s the Oklahoma State Bureau of Investigation. In Wyoming, at least according to a cursory internet search, is the Division of Criminal Investigation. Almost all cop shows about any tier of law enforcement try to paint the media as trivial and irresponsibly, and inexorably at odds with law enforcement, and I can tell you from personal experience that just isn’t the case. In fact, the last four sheriffs here in Pontotoc County were both my friends and neighbors, and always regarded me as welcome on their crime scenes as a sensible, responsible member of the press. 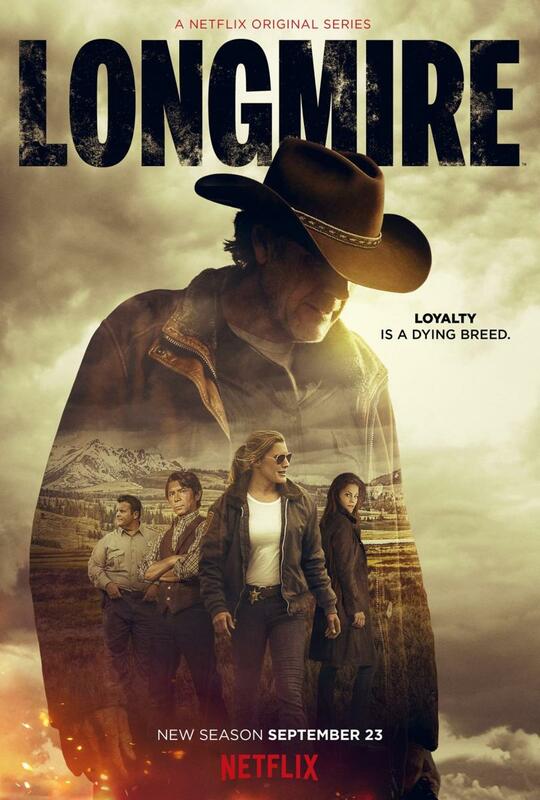 Despite all these criticisms, which of course reach beyond a single television program and extend to all filmed fiction, Abby and I find Longmire fun and entertaining, and recommend it to anyone wanting to add a decent show to their Netflix queue. I’ve often noticed the differences between police procedurals and real life, and have thought it would be interesting to write a (fictional) story that operated on the intricate relationships between and among law enforcement agencies. But screenwriters have to come down on the side of entertainment, drama, and plain old storytelling, and such technical details would probably require too much explanation for a single hour show, or even a two-hour movie. Still, it would be nice to present things more as they really are. I agree about how the press is portrayed, as well, and it would really be interesting to have a story that does a more honest representation of newspaper/law enforcement relations. That’ll probably never happen, either. Hey, Lethal Weapon is on FOX! I joshingly referenced the Lethal Weapon reboot currently clogging up Fox’s schedule, but the truth is, the original Lethal Weapon movie (made back when Mel Gibson was acceptable) is, kind of, an interesting take on how law enforcement agencies function. Maybe not on the level of organizational hierarchies, but in terms of how police officers actually talk to each other. The dark humor, the profanity, the casual references to types of firearms and ballistics, the exhaustion, the frankness, the over-caffeinated craziness. For my money, the best police procedural of all time is LA Confidential, which you much watch immediately if you have never seen it. I hope you win a Pulitzer for your courageous journalism moves during the apprehension of the fugitive. That was super cool. Spilled Milk? Not spilt milk. I like that. I haven’t yet watched any of Longmire, though I have a few friends (in addition to you) who strongly recommend it. Perhaps I’ll get a chance some day. As for your bullet points, my own experiences in covering law enforcement (in Seminole County, Okla.) means that our opinions on these topics match closely. Especially your last point, regarding media relations with law enforcement, rings true to me. I admit that when I was younger, I allowed movies and shows to paint an incorrect view of journalists; they were almost always painted as muckrakers and meddlesome vultures, and I believed it. It wasn’t until I began working for a newspaper that I began to understand the other side of the coin: how important journalism is to our nation. And, like you, I often worked closely with law enforcement. It took a while to develop the trust (partly because our newspaper had a long and adversarial history with local agencies), but once the trust was there, I rarely experienced the level of “at odds” that these shows/movies almost always describe.